There is hardly a topic, which has so captured the attention of the textile production industry in the last few years as the increasing use of digitalisation and Industry 4.0, the vision behind it. This makes this year's Texprocess 2017 Trade Fair into a quite special event, because this is where textile companies from all over Europe are able to take a close look for themselves and to find out where the journey is leading. It is worthwhile to cast a glance towards the future of textiles and to equip ourselves for the major changes, which are about to affect textile production. We want to see what it is that makes Texprocess so interesting as regards these issues. 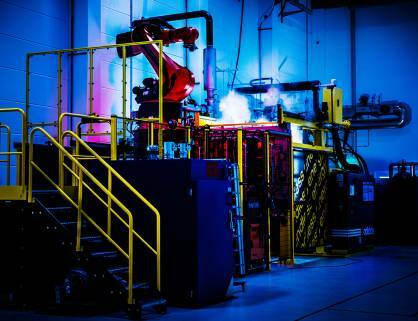 The introduction of the "speed factory" by adidas was the most recent indication that Industry 4.0 is much faster than was anticipated by accepted operational reality. And if automotive suppliers, such as OECHSLER can found a textile branch and use their many years of experience with industrial robots to take this to the classic CMT sector, this automatically means that all established manufacturers will have to put these technical changes into place sooner or later. Ultimately, it means that we have to review and realign corporate strategy. The decisive issues here are the extent of the present status of the new technology and the impetus it is likely to have in the next 5 - 10 years. These important questions are nowhere better answered or more controversially discussed than at Texprocess. Even from the exhibitors' side it is no surprise that four months prior to the start of the fair the Frankfurt Trade Fair registered the highest registration figures in the history of Texprocess, for fundamental technological change always offers plenty of room for new players, who are diversifying from other fields and sectors. This best example of this is software, for it is customary for this production support sector to communicate successful solutions from CAD, ERP, PLM or SCM to as many other industries as possible. However, despite a high degree of expertise in digitalisation, this will certainly not be easy, because on one hand the textile industry is very specialised and on the other in these areas it already has highly specialised firms with outstanding products. Conversely, it is well-known that success lies in a niche market and there are plenty of those in information technology. Conceivable possibilities include new control systems, intelligent Cloud and big data solutions, new forms of human-to-machine communication, such as data gloves or VR glasses, algorithms, expert systems, to mention just a few. Logistics products, which also receive huge impetus from digitalisation and robotics, are a further example. All in all, even on the fringes the new technologies are very varied and in some cases, disruptive, so that solutions of this kind may bring completely new impetus into the textile sector. Texprocess once more is demonstrating its strength, in that its range of products embraces all the steps in textile value creation. For visitors this wealth of new technologies means more than ever leaving one's comfort zone, looking around and peering into nooks and crannies, since each individual change in a process can affect the entire textile value chain. Innovation in the areas of design, IT and digital textile printing is becoming evident and tangible. 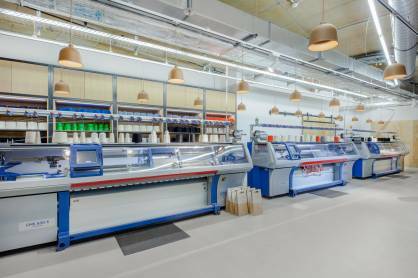 One of the highlights in this area must be the Digital Textile Micro Factory, with which the German Institutes of Textile and Fiber Research Denkendorf (DITF) in collaboration with well-known companies in the textile sector are presenting a small, integral clothing production chain. The production process is demonstrated, from digital design through digital printing to cutting out and then on to assembly and labelling. The will to make production sustainable and the desire for customisable products up to "batch size 1" make this form of production increasingly more interesting and the selected technologies with their high degrees of freedom and automation are already offering these possibilities. The Micro Factory has been presented already at this year's Heimtextil and seems rather like a laboratory, but makes it very clear in principle where the journey is leading. The "store factories" come even closer to the customer than the "micro factories". In these the customer can design his garment for himself, there in the shop and have it produced within a few hours. In February 2017 adidas presented a "store factory" of this kind in Berlin as the icing on the cake to a research project. Up until mid-March in the chic Bikini Berlin concept shopping mall customers were able to design their own "Knit for You" pullovers. Their measurements were transmitted by 3D scanners to Stoll CMS 830S knitting machines and their merino wool pullovers were produced straight away. Is this sort of thing just an advertising idea or is it a realistic approach for industrial manufacture? At more than 200 Euros for a pullover it is certainly not an application for a mass market, but it is at least a green light for a new textile segment. A segment, which may grow quickly and thus become competition for every other kind of production. Even at this early stage it is worthwhile to discuss its consequences for the future with other experts and one's own network and it is hard to imagine a better place to do this than in May in Frankfurt at Texprocess. Two companies, both market leaders are presenting the contemporary revolutionary consequences of digitalisation in the clothing industry and for the large mass markets. At Texprocess under the motto, "Digital is now", the Human Solutions Group is showing what is already possible today, even if it seems as if we are dreaming of the future. For instance, put on a pair of glasses and enter a virtual room together with your partners from all over the world to view the current collection and take decisions. Two highlights on the stand, which revolutionise the development of clothing, are the Digital Fashion Board and the digital showroom. The Digital Fashion Board supersedes the analogue mood board and connects product development and visualisation in 3D with data, which come directly from the PLM system In this way the right prototype is more quickly discovered and important decisions can be taken on the digital model, even before any component has been sewn. And in the digital showroom people from different sites can jointly plan, view and revise the next collection. Gerber Technology pursues a similar motto with "Embrace Your Digital Reality." Gerber sees the fashion industry on the brink of a huge digital technology revolution and offers state-of-the-art digital design tools, which help clothing manufacturers to reduce costs by millions of Euros, to increase throughput, reduce waste and - most importantly - to remain in the "fast fashion" era. Gerber's defined objective is to support the individual transformation of processes right down to the single user and to give advice on this technology. Texprocess offers Gerber the opportunity to show the industry leaders how easy it can be to connect systems so that data may flow seamlessly from design and development right through to the supply chain and how software and "Internet of things" technology can be used to increase visibility and efficiency. Their presentations at the stand include "Changing the Game" and "Smart Factory". Changing the Game targets the expansion of the boundaries of supply chain visibility and Smart Factory demonstrates state-of-the-art technologies for digitalising the clothing industry. In addition, Gerber provides information on the consequences of these technologies on CSR. Of course, as well as software there will as usual also be many innovations in the other Texprocess core areas. The established companies, the top dogs of Texprocess will take the opportunity to demonstrate their particular innovative strength. This applies to all the technologies all along the textile value chain, such as cutting out, sewing, joining, embroidery and knitting up to finishing. For instance, the VEIT Group has advertised a new shirt finisher, which has been optimised for an even greater spectrum in the production of shirts and which is intended to achieve an unprecedented quality of finish. The presentation from the SoftWear Automation Company will also be trend-setting; this firm is advertising on their website nothing less than the re-design of the value chain of the textile and clothing industry. 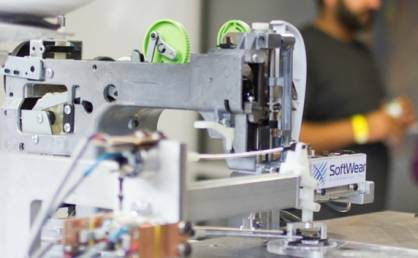 They offer their SEWBOTS automatic sewing robots and are currently accepting advance orders for fully automated production lines for the manufacture of T-shirts. In any case, sewing robots could potentially become the really major topic for Texprocess, on which many of the established manufacturers will stay their hand prior to the start of the trade fair. This very brief extract of Texprocess topics and technologies gives an indication of how significant and interesting this year's event is going to be. And with the Texprocess Forum, the special interactive section for Textile Processing Technologies for Space Travel, the second edition of the Innovative Apparel Show after its huge success two years ago and the Texprocess Innovation Award, many more highlights await the visitors. This Trade Fair is an event to look forward to.